Developer Slate Asset Mgmt. & Globizen Dev. A beautifully designed midrise building in Toronto’s vibrant Junction neighbourhood. 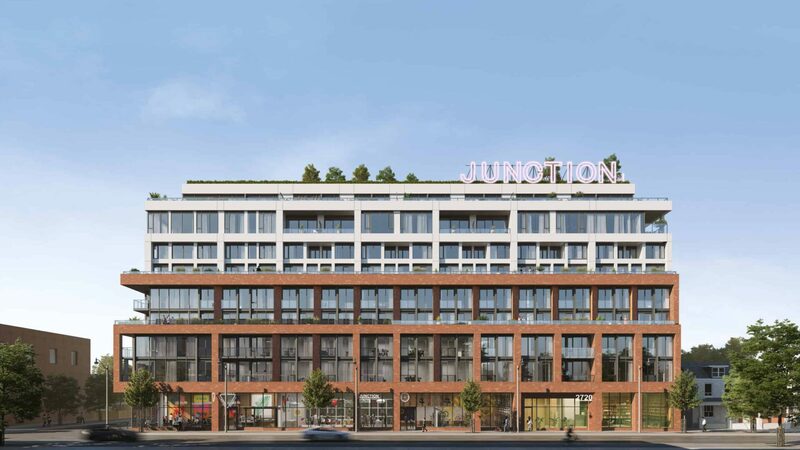 Junction House will present a range of living options, including spacious 1, 2 and 3 bedroom lofts, 2 storey Junction Houses and a limited collection of townhomes. All housed in a striking modern building designed by Toronto’s superkul architects. Carefully designed to celebrate the entry to the Junction, the building will also introduce new vibrant retail to the Dundas Street main street. Rising nine stories above, the condos will provide exceptional views over the neighbourhood and towards downtown Toronto. With a special location at the gateway to the Junction, Junction House promises to introduce a graceful and modern residential building to this exciting neighbourhood. This development is located in park heaven, with 13 parks and a long list of recreation facilities within a 15 min walk.